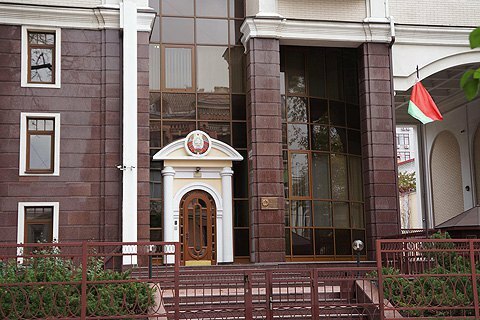 The Foreign Ministry retaliated to Belarus demarche. Ukraine, guided by the principle of reciprocity, expelled a Belarusian diplomat from the country in retaliation to Belarus announcing an adviser of the Ukrainian Embassy in Belarus, Ihor Skvortsov, persona non grata, the speaker of the foreign ministry Mariana Betsa said on Tuesday. The spokeswoman did not specify the name and post of the deported Belarus diplomat. On 17 November, it became known the reporter of UA:Ukrainian radio Pavlo Sharoyko was detained in Minsk on 25 October. The State Security Committee (KGB) of Belarus stated on Monday, that Sharoyko was arrested on the charges of "creating a network of agents in the country." KGB said Sharoyko acknowledged that he is a Ukrainian career intelligence officer, and that his intelligence activities were coordinated by the Counsellor of Ukrainian Embassy to Belarus, Ihor Skvortsov, in connection with which the latter has been declared persona non grata.